Experience, expertise and the manpower define our ability to deliver a Land Restoration project of any size. We have successfully worked alongside landowners to deliver end to end projects from application and design through to completion and delivery of projects varying in size and complexity. We provide a comprehensive Muck in and around London and the Home Counties allowing us to supply the material for your project. We are happy to discuss any projects in these areas.. Contact us to find out more about our waste management and land restoration expertise. . The plans, to overhaul 16 acres of land to provide high quality playing surfaces, install a sustainable irrigation system and a full size floodlit artificial pitch, was given planning permission in October 2013 and featured in the popular series “Permission Impossible” on BBC2. Along with an artificial pitch, the major project will provide a range of senior and junior pitches to Sport England standards. A lagoon will also be built as part of a sustainable water harvesting system to keep the new pitches drained and irrigated all year round. Over 10,000 loads of material are expected on the project. A two year project to provide capping material, produced to specification, to allow completion of the landfill. 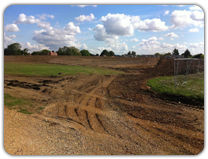 Suucessfully completed a 5 year project to create a Golf Course in Chadwell Heath. Working alongside our client, we provided inert and non-hazardous muck away. Successfully completed a 3 year project in Enfield to design and construct a Bund alongside land beside the M25. We dealt with the application and the importation of the muck and provided all documentation to the client on completion. Completed a noise bund along the M1 at Hertfordshire Showground liaising with the client and working with the local authority throughout the project. Thames Materials muck away and recycled materials Construction waste and management Solutions. Call us now to discuss your requirements. We cover London and the Home Counties 0208 840 7233.